Crystallization of low molecular weight polyethylene from concentrated solutions has been studied using small angle neutron scattering (SANS). The detection sensitivity of the volume fraction degree of crystallinity is estimated to be 10-5, allowing for measuring the structure and kinetics during the very early stages of crystal growth. 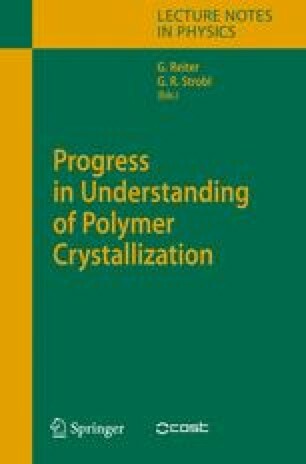 SANS spectra for both the early and late stages of crystallization can be satisfactorily interpreted with a lamellar crystal model; there is no evidence of diverging or spinodal-decomposition-like density fluctuations during the early stage of crystallization in polyethylene solutions. A possible explanation of the dominant wavevector in small angle x-ray scattering that led to the proposal of “spinodal decomposition” mechanism for early stage crystallization is suggested.